Edited by Ron Spatz. 256 pages. $12. The new issue of AQR (which, despite its name, comes out twice a year in a handsome, thick volume) once again showcases some of the best literary writing to be found anywhere in America. Consisting of 10 fiction stories, a long memoir, and poems by 21 poets, this issue is exceptional for its emotional depth and warmth. The many voices, coming from disparate experiences and imaginations, open widely to vulnerability and the strength of the human spirit. This is not to say that the narratives aren’t often uncomfortable, because they are, but that the writers and poets here see their ways into understanding and compassion. Studies have shown that reading literary fiction helps us become more empathetic human beings. The same is likely true for any reading that carries us into life experiences different from our own. Whether binging on AQR from first page to last or dipping in and out of its sections over time, readers will find themselves, days later, thinking about the characters they’ve met here — not just thinking, but feeling how it was for them, in situations that test them. While today’s literary journals are generally reluctant, for various reasons, to publish long works, AQR stands out from this norm and positively shines in its embrace of fully realized, deeply diving narratives. The 10 stories here reward readers with plunges well below the surface of characters’ lives. Many of them involve complicated family relationships or generational conflicts. Most are realistic; that is, they might have happened, or they might happen yet. In every case, something changes by the end; someone learns something, someone makes a decision, someone acts in a way that was not possible before the story began. Among the most moving stories are four written by women, involving young women characters at critical points in their lives. In “Readying the Colors,” by Amy Fanning, a 16-year-old with vague artistic ambitions and an attractiveness that seems to define her with men, sets out on a bus trip to visit her uncommunicative older sister. In “Roar,” by Allison Wyss, a maybe-pregnant and somewhat off-center but endearing narrator lives in a trailer with her brother and a caged bird. In “Gathering the Dead,” by Polly Buckingham, a new college student finds that a professor’s simple question starts her on a journey of self-identity. In “Middlemen,” a woman in love with another woman and with a father who’s inappropriately curious, questions herself about the nature of love and leaving. AQR is known for its special sections, and this issue has a very special one indeed — a long memoir-essay by Christie Hodgen, the author of three books of fiction. Titled “1999,” this work describes that year of her life, when she was twenty-five, an aspiring writer full of self-doubt. The storytelling is richly detailed, the writing is absolutely beautiful, and — as with the fiction in this issue — the illuminated lives, of the narrator and the others who inhabited her orbit, are full of confusion, desire, and grace. In this memoir, Hodgen describes her time as a barista in a not-particularly-classy Louisville cafe. She’s curious about everything in the world but seems unable to choose a path that would take her beyond a minimum-wage job and the fantasy of riding a train’s boxcar into another life. Pathos and humor collide as she shares duties with an assortment of colleagues. Feeling like a college freshman all over again, she finds herself “sitting in on a series of lectures for which nothing in my previous life has prepared me.” She names the courses taught by her “new professors;” These include Dune and Other Science Fiction Novels, But Mostly Dune, Sleeve Tattoos and the Ancient Symbols of Which They Are Comprised, and Special Problems in Tofu Management. The poetry section is, again, a strong compilation, distinguished for its variation in both form and content. The work is complex and interesting, largely narrative. Here, well-known Alaska poet John Morgan is represented by “Palladium Seeds for Prostate Cancer.” Former Alaskan Alyse Knorr, in “Epistemology of Wolves,” offers a call-and-response between two ways of knowing. Again, AQR makes room for a very long work, the smart and engaging “Matisse’s Great-Granddaughter,” by Jennifer Habel. Ted Kooser, the U. S. Poet Laureate from 2004–06 and one of our country’s most read and appreciated poets, rounds out the collection with six prose poems, each asking what is and what might have been: a buried plumb bob, a yard sale’s bags of unused birthday and sympathy cards, weathered letters on the back of an old barn, folks once loved and now gone. 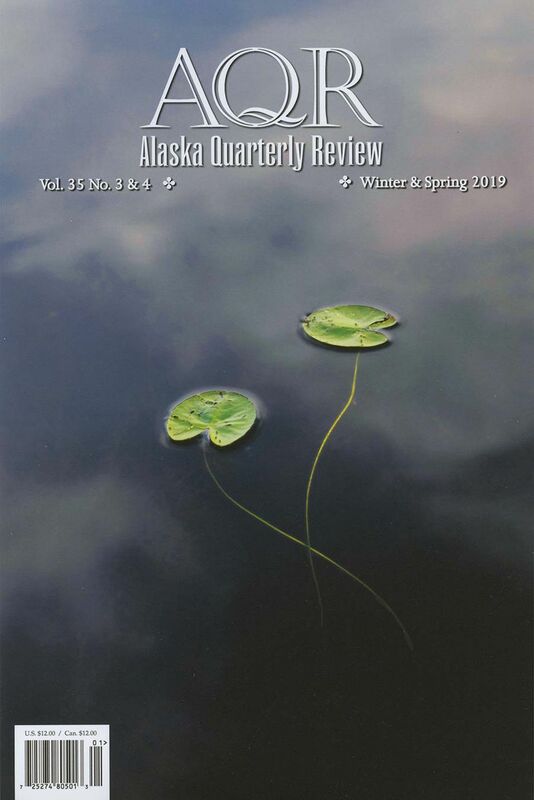 Despite having “Alaska” in its name, there is nothing geographically limiting about this or any issue of Alaska Quarterly Review. Its significant reputation results from its ability to attract and publish excellent writing from all over. What’s Alaskan about it is an aesthetic that values spirited independence, possibility, and a shared humanity that crosses time, space, cultures, and political divides. For thirty-five years now, it has represented our university and our state with distinction. And always, there’s the beautiful cover, this one a photo by Fairbanks photographer Kate Wool.